What was it that set the love between King Henry VIII and Anne Boleyn apart from the affairs of Francis I or Charles V? Was it pure recklessness, or was it political in nature? Was he manipulated by the metaphorical witchcraft Anne had so often been accused of, or was he a slave to his own lust? Seldom in history has love been the impetus for a dramatic change in not only the social but the political spectrums of a country. Yet the love Henry held for Anne Boleyn, a woman of no great birth or importance represents a paradigm shift in English society that can be seen as momentous, if not radical, in the history of England. Love is seen as extraordinary when it changes a series of unlikely events. In history, when one great person falls for another, people often ask for the reason. Sometimes, physical beauty is enough. Of course, one could say that physical beauty is always enough. However, people, especially in present day society, reject the idea of long lasting physical love. Anne Boleyn was, by all accounts, not a remarkably beautiful woman, but then not many remarkable women were beautiful. She was, however, filled with a certain charm and elegance that made her stand out from the court beauties. Some would attribute it to her French education, while others would say that it was innate. Whatever it was, Anne knew how to use it to her advantage. She had attracted and fell in love with one of the most prestigious aristocratic heirs of England, the House of Percy that still continues to hold their titles to this day. Her greatest conquest, however, was not a Lord who lives a northern castle but the King of England himself. In all definitions of the word, Anne Boleyn seemed a Renaissance femme fatale. She was educated, provocative both mentally and physically and above all, clever. It would be wrong to put her into the present day ideas of feminism. Feminism, an idea that sparked two hundred years later, during the French Revolution was unheard of during the Renaissance. King Henry was completely enamoured. His love letters, although incomparable to those of great poets like Thomas Wyatt, were filled with ardent desire for his lady. Henry’s love for Anne seemed derived from Petrarchan verse, not something seemingly rational. He had disregarded the traditional rationalist teachings of reason above heart in favour of pure sentimentality. The love Henry bore for Anne was atypical. Men were never to be subjected to women. Women were all that was evil and wrong with the world. They lacked reason and thus were to be subjugated to men. For hadn’t Adam fallen out of Eden from the temptations of Eve? It was considered unacceptable to declare oneself the slave of a woman in the most Catholic court of King Henry VIII. Women were chattel. Henry’s early treatments of his own mistresses were testament to that, not to mention the purely patriarchal society that emerged through the ideas of the Renaissance. The Aristotelian ideas of the divinity of reason had resurfaced. In an attempt by the Italians to renew what they saw as their inherited right, the antiquity of the ancient world was recreated and emulated in the philosophical works of great men. Even though the religious aspect of the subordination of women was now less pronounced in the increasingly secular atmosphere of the Renaissance, the rational ideals that were so prevalent in pre-Scientific Revolution Europe still carried sentiments regarding the inferiority of women. How did Anne break away from this type of prejudice? She had made a name for herself using the only charms that were available to a woman at that time. Her womanly charms had cast her in the dramatic backdrop of the prim English court. In the French court, she had learned that sexuality could be a dangerous weapon, something she was not afraid to play to her advantage. As Oscar Wilde so deftly put it in his sonnets, “True love is but a woman’s toy.” Under the pretences of modesty, Anne drove the King to the brink of madness in his love for her, only later to drive it again to madness in his evasion of her. Modern feminists would argue that she had used what was subject to men, driven by her own gender role to attain power. Regardless of the blind lack of historical background that these feminists put in place, it definitely worked. For a while, Anne was the most powerful woman in England and one of the most powerful in Europe even while still lawfully the daughter of a petty English Earl. She stood out by her own right. Henry found her radically different, intoxicating, so much so that he started listening to her advice. For a while, Anne commanded the power around Henry. Using her womanhood, she was able to sway foreign diplomacy through the indulgence of her beloved. Henry had no choice; he was her slave as was professed in his passionate letters. She used her presence as a way to seduce him. Anne was a brilliant conversationalist. She made Henry forget about the old prejudices against women. For how could one that caught the heart of the King of England come off a breed that was completely evil, emotional and unholy? Henry loved himself too much to believe that and for a while, Anne controlled not only the woman’s world but a man’s world. By most accounts, the early courtship was nothing more than a chivalrous flirtation. Up until Wolsey intercepted Knight on his journey to Rome, it was still believed that Henry was to marry Renee of France. That all soon changed, whether at the bidding of Henry or the machinations of Anne, it is impossible to conceive. Anne however, was not to be gotten rid of so easily. She usurped Cardinal Wolsey and Sir Thomas More as Henry’s most trusted advisor, all who opposed her ultimately lost their heads. It could be said that the King would have broken with Rome anyways as the driving force behind the annulment was the King’s need for a son. He cared not who he got the son from, as long as they were married by law and before God. This is untrue. Renee of France was Wolsey’s candidate. If King Henry had continued with the union, then Wolsey, as a cardinal, would have done all he could to persuade Henry to stay with the Church. Renee was also a Catholic and there is a very small chance that she would marry a Protestant, even with political ties. Denominations regarded themselves as knowing the ultimate way to God. Renee marrying a Protestant against her Catholic faith would be seen as choosing hell. 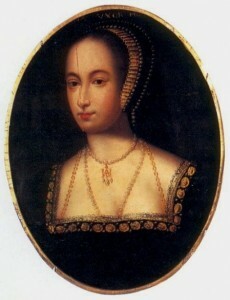 Anne had grown up under the radical influence of Marguerite of Navarre. She had heard the protestant views espoused by Marguerite. The introduction of the Supplication of Beggars by Simon Fish to Henry was an example of Anne’s influence on the Protestant reformation. It was Anne that first gave Henry the idea that the King can be head for both Church and state in the realm. Henry’s love for her had changed the foundations of England forever, breaking it off from Rome in favour of the Church of England where it was a cradle for the agrarian and industrial revolution. The protestant work ethic that comes from the stereotypical puritan image established the drive for wealth. England was a haven for Protestants and the Calvinist ideas soon spread into the House of Commons. Their staunch belief of the saviour of mankind and the need for the rich to give back to the poor was the driving force of the English Civil War. Their desire to keep the throne Protestant drove the Glorious Revolution which resulted in the English Bill of Rights, the creation of a constitutional monarchy that still exists to this day, and spreading across the five continents through the Commonwealth of Queen Victoria.